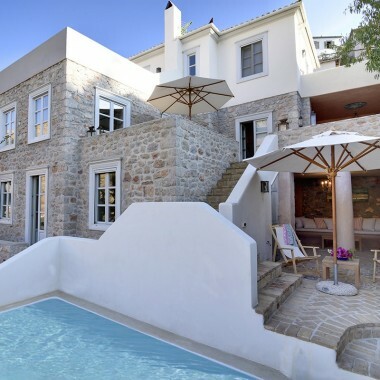 Arguably one of the most beautiful rental villas on Hydra, this stunning property is situated high above the port with the most spectacular views out to the sea. 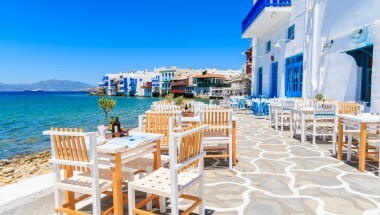 The harbour with its waterfront tavernas, cafes and shops is about 15 minutes walk downhill. The villa is on three levels with terraces at each level, including areas furnished for dining and relaxing outdoors, including a spacious lower terrace with small pool. The interiors are elegant and sophisticated, decorated and furnished to a high standard by the interior designer owners. There is a wonderful feeling of space with high domed ceilings and archways, and marble floors. Walls painted in shades of white and cream provide the background to lovely antique furniture and some contemporary art. The property is on three levels, with a marble staircase leading to the main first floor hallway and living areas, including a formal dining area with chandelier and antique dining table, seating 10. From the main hallway, the marble staircase continues up to the second floor where there are 2 bedrooms with en-suite bathrooms. The Master bedroom has a fabulous, marble bathtub raised on a dais with spectacular views over the Bay of Hydra which can be enjoyed to the full whilst bathing. On the ground floor is a guest wing, also beautifully furnished throughout with stylishly chosen antique furniture, paintings, objets d’art and a large library of books. The ground floor rooms open to the terrace with swimming pool. Further amenities include satellite TV and Wi-Fi internet. In all months other than July and August, it is possible for smaller groups to rent the lower part of the house only. Whether the whole house is rented, or just the lower guest house, exclusive use of the swimming pool is included in the price. Please check with us for prices for use of the guest house only. There are also a couple of sofa-beds at the property (charged extra) which makes the maximum occupancy of this very special rental villa 10 people in total. Entrance hall. Reception room with fireplace and doors leading to the main veranda. Well equipped kitchen with antique tiled floor. Spacious living/dining area. From the main hallway, the marble staircase continues up to the 2nd level where there are 2 bedrooms: The main master bedroom suite has double bed and en-suite bathroom with marble bathtub, shower and WC. The master bedroom suite has doors leading out onto the large upper terrace shared with the 2nd double bedroom. The 2nd bedroom has a queen sized, antique brass bed with en-suite bathroom. Doors lead from this bedroom to the upper level veranda which runs the length of the house. On the ground floor of the property is a very spacious and comfortable guest wing which is fully accessible from the main part of the house via the marble staircase but which is totally self-contained with its own kitchen, living room and dining facilities. Off the living room is a well appointed guest bathroom with shower. An inner hallway has access to a bathroom with bath and shower as well as 2 spacious double/twin bedrooms. 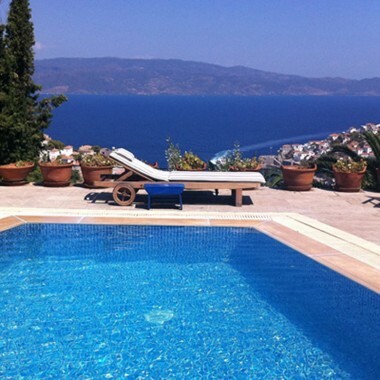 A beautiful rental property, situated high above the port of Hydra, with the most spectacular views out to the sea. The harbour with its waterfront tavernas, cafes and shops is about 15 minutes walk downhill. The villa is on three levels with terraces at each level, with areas furnished for dining and relaxing outdoors, including a small swimming pool on the lower level. 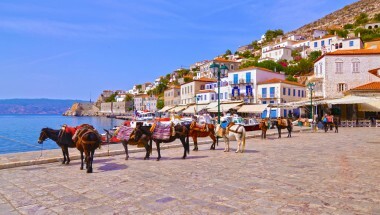 Hydra harbour/port - approximately 15 minutes walk: Donkey transport to help with luggage can be arranged on request.